Troy has finished with his stockpile grazing for this season. Here he shares how many days he made it, and talks about lessons learned and the questions he’s asking to help him prepare for next year. Editors Note: This is the last in this series, but the story will certainly continue into the future. If you’ve missed anything in this great series, here’s the whole series. 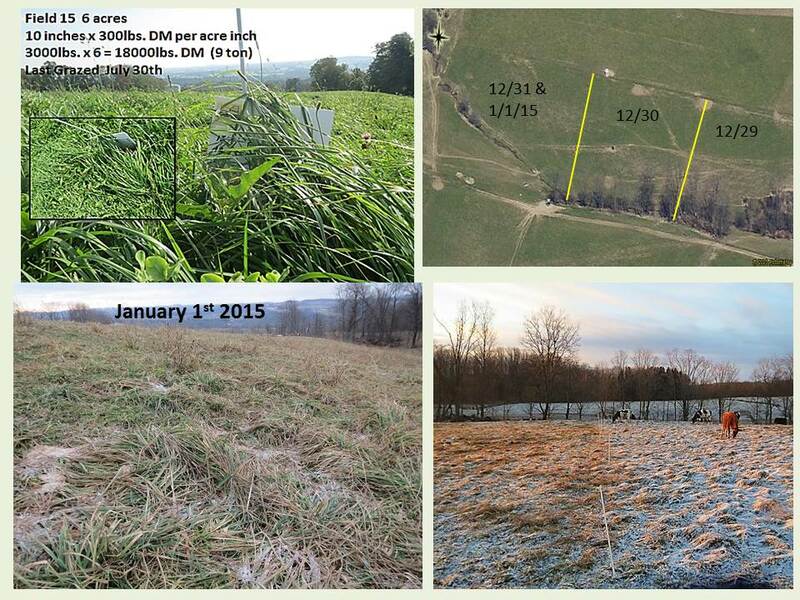 Happy New Year 2015 from paddock 15 which is the final piece of grazeable forage. The goal of grazing until January 1st, 2015 has been met. Yea! That means the stockpile grazing planning met reality which was unknown back on October 17th when we started this experiment. And even further back on September 22nd when we did an On Pasture video, and came up with how many tons of standing forage and how long it might last. It’s been a long time since April 14th (257 grazing days) when I started grazing for the first time. Here’s a video to give you a great view of what conditions looked like as we wrapped up the season. Click to zoom in and see the grazing season. Remember these calculations from when I started this process? 53 x 30lbs/day = 1590lbs. 4 x 42lbs./day = 168lbs 2 x 60lbs./day = 120lbs. What do I have in pasture inventory?? Click to zoom in and see where we’ve been this year with Field 15. 1/1/2015 The final answer was 82 days of feed. A far cry from 142 days for sure but reassuring to my gut and experience managing this land. Does this mean I/cows were only 59% efficient in utilizing the forage? Does it mean that 41% of the forage melted into the soil or was consumed by wildlife, microbes or is catching snow? Did the cows eat more than 3.5% DM/day? How much did the weather influence what happened? 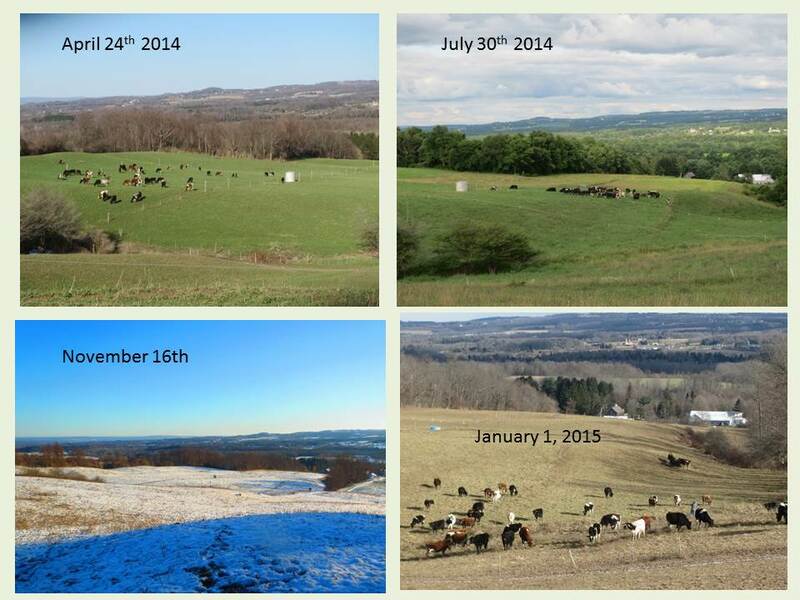 Was the grazing manager wrong in his calculations and approach? Heck, I don’t know. I did the best I could given the tools and experience I have. One thing is for sure, I plan conservatively, monitor often and remain flexible in dealing with conditions. 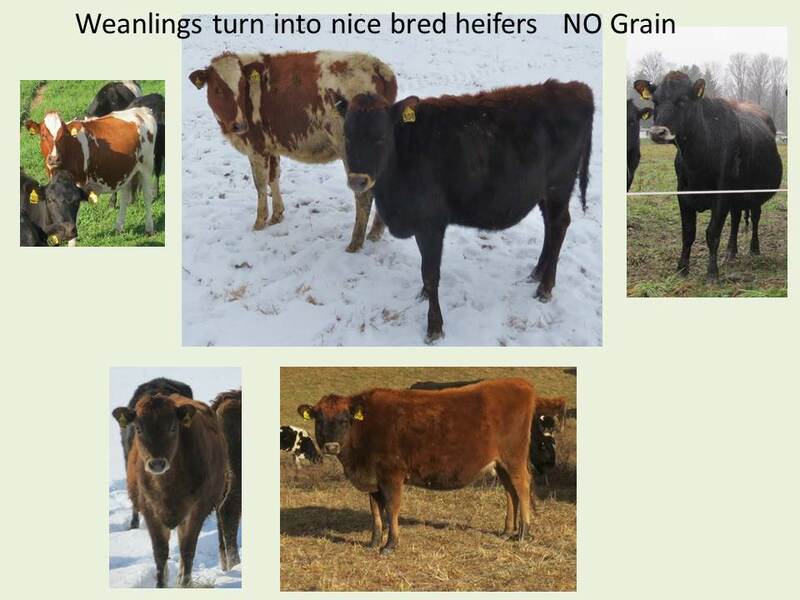 The whole story is here in the Grazing Chart. Not only will this tell you how the season went, but it’s a good example of how I use grazing charts. Click to zoom in and see it full size. If you look at my grazing chart and pictures you’ll see how it all played out. As the last of December came to a close, the warmer weather around Christmas melted the snow on the final grazing push into paddock 15. As luck would have it, the ground froze and the forage was quite available. I still fed a bale per day because the heifers seemed to really bloom with the combination of fresh grass and hay. It also added fertility to the paddock. 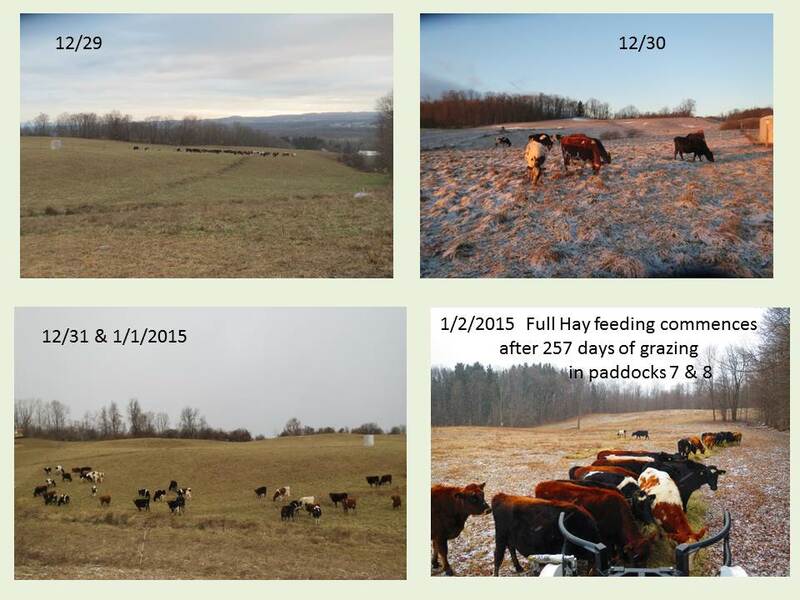 Looking back at my past grazing seasons (the benefit of having a grazing chart! ), I grazed till November 12th in 2011, November 24th in 2012, December 18 in 2013 and now I’m up to January 1st. It’s nice to feel like I’m making some progress. The closer I get to only feeding for 100 days the better in my book. The challenge now is to find out ways to go beyond. 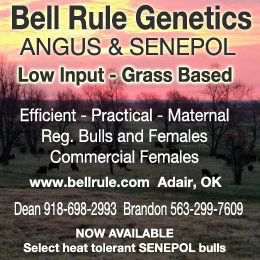 I believe it will take some combination of annuals, rented ground, fescue, destocking, fertility and luck. Because I’ve custom grazed all sorts and sizes of cows (beef and dairy), I’m admitting stockpiled grazing can have bigger impacts if you have dry stock with reduced nutritional needs. Growing dairy animals need more groceries and a higher level of management to keep them well-fed. It can be a struggle to put on back fat when the frame is still growing. The economics of this 82 day stockpiled grazing reality check are mixed. I feel there is much to explore in this regard neither good nor bad but different. Our goals generally dictate how we approach making money. Our farm is a bank account with savings and checking accounts and short and long term investment strategies that must be considered when making decisions. 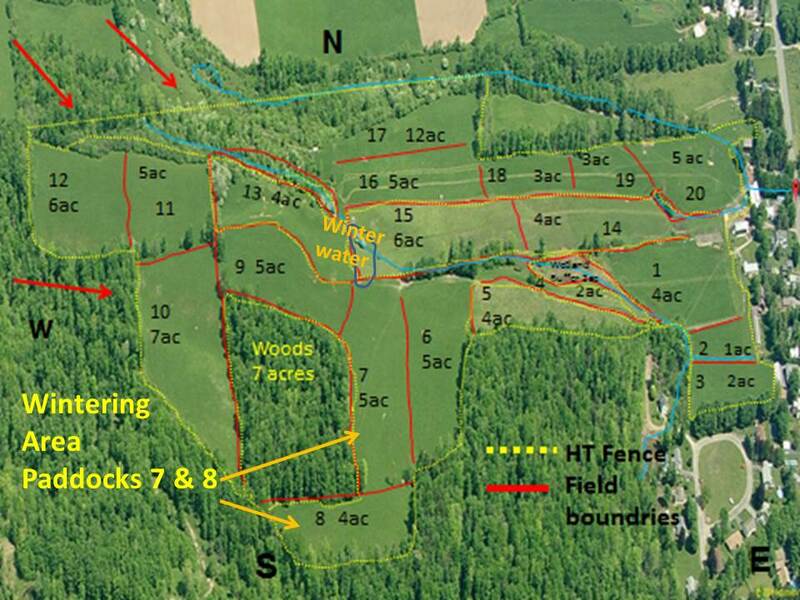 Click to zoom in and see the farm’s pasture layout. I’m approaching stockpile grazing economics from several fronts since we contract graze organically. From a pure money standpoint, this brought in 5 grand worth of income or about $1/day/head. By succumbing to the weather and feeding hay, we lost about 1000 bucks worth of income. However we added about 9 tons of fertility to 7 paddocks worth about 400 dollars (according to Jim Gerrish’s calculations on the value of a ton of hay for fertilizer). 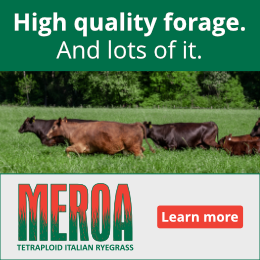 Adding 30-40 more grazing days to the whole grazing season makes us more money overall with the added benefit of a rested plant community. Stuff that’s harder to measure are the benefits to feeding the soil life through winter, feeding the wildlife better, plants coming up with more vigor in the spring, increased organic matter, labor relation costs, animals health benefits, people’s health benefits from drinking organic, grass-fed milk, scenery, and also it gives us joy (most days). What’s the price for joy and happiness? So what am I doing now? Feeding hay just like most farmers do. I am keeping them in paddocks 7 and 8 which are sheltered by our woods. They have access to the stream in paddock 15. This is a planned event also to build fertility with perhaps some over-seeding in the spring depending on animal impact. I am also utilizing the wood’s interior especially when the lake effect cranks up. I roll out a few bales now and then to give them a nice place to lie down and keep moving the big square bales daily to spread the fertility around. With the frigid weather, the land impact is nil. I could only hope this would last for awhile. The last thing I’ll leave you with is the opportunity to see how this stockpile grazing regimen affects the coming year’s plants and animals. I purposely left more residual in spots and because of the wet snow, some paddocks got chewed up. How will these recover? Will it cost me? Should I consider using my sacrifice area more? Too many questions not enough answers! 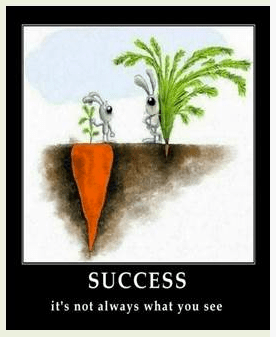 I hope you have found my toil, sharing and pictures, fruitful. 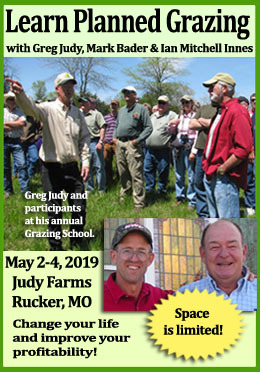 Full disclosure, I’ve incurred $285 for soil tests, $144 for forage tests, $150 in video production and about 50 hours of time in doing this 82 day educational outreach for you. So that’s about $1500 worth of effort or about $17/day. Please support the folks and events that hire me to lead grazing planning days on the farm or have me teach others using my experiences around the Northeast. This helps defray my costs at the farm. Thank you and I look forward to more discussion on using grasslands and grazing to improve the planet and people’s lives. Read more and keep up with Troy on his website. And write him a comment. You don’t know how much it means to someone doing this kind of work to hear back from the people he was hoping to help! Troy, we got this comment and these questions on our Facebook page from Mike Wallace. Could you respond? In the video there appeared to be considerable residual forage on the pasture. I am taking this to mean he has not fed any hay to this point, but will leave the stock on these pastures for the rest of the winter with supplementally fed hay. Is that true, and if so what percent of their diet does he expect to feed as hay/get from the residual? Also, will he continue to rotate through these paddocks, or will the stock be allowed to free will grazing? Hey Mike, If you go back to through my series, you’ll find some of the answers. The residual you saw was the last bit of grazeable forage. I did feed one bale of hay from December 8th through Jan. 1st in addition to the stockpile. The farm is now grazed off and I am wintering cattle on planned paddocks that contain woods or hedgerows for shelter. They are on full baleage and hay now. Since its frozen with snow cover it makes for awesome wintering with no mud. At the onset of mud season I’ll be looking to keep them in my sacrifice areas until good grass becomes available. Thanks for the comments. I’m glad you are attaining a higher level of understanding about the realities of grazing management. It flatters me that you see I’m trying to help all farmers improve their bottom line and land management. Next year it will be your turn. Thanks again to my mentor, Jim Gerrish for inspiring me to change. Troy you and this series are an inspiration ! 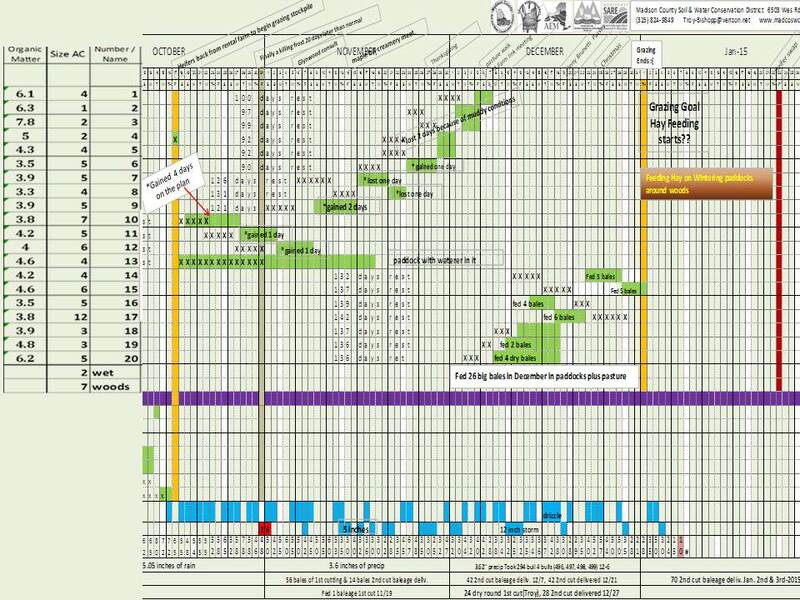 I have looked forward to every update, and find myself enthusiastically running to my chart and trying to plot the 2015 grazing season to achieve that January goal. It has really made me focus on REST and got the gears working in the cranium. Thank you ! Troy, your series helped us a lot as we jumped into stockpiling this winter. We had the benefit of being understocked, which hurt us in the growing season, but gave us a lot more leeway this winter while we learned. Following along with your planning, challenges and ultimately success with this project was really encouraging. Thanks so much. And don’t quit walking daily now that you’ve gotta ride the ‘diesel wheelchair’, as my old boy neighbour calls his tractor! The cattle looked good.Thanks for all your efforts.